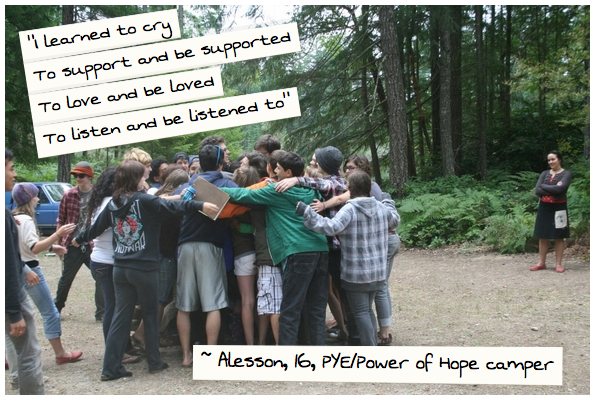 “My daughter, who turns 18 in October, just graduated from Power of Hope, after attending the camp for third time on Cortes Island, BC. It has been a joy for me to watch her enthusiasm grow for the experience and see the rewards it has brought her, both in personal growth and increased self-confidence and in wonderful connections and friendships it has given her. I had to drag her kicking and screaming to her first POH. Now, I have to tear her away, and she can’t wait to apply to return as a counselor. Having met many POH kids, I can attest to the quality and lasting value of the unique program you have created. It is solid gold. “I want to thank you and the organizers of the Earth Arts weekend for putting on such a terrific event! Matthew returned home on Sunday evening absolutely amazed at himself and the fabulous time he had. He has nothing but positive things to say about his experience, from the incredibly supportive atmosphere, to the talents of the young people attending, the skills of the facilitators and presenters, and even the food. You and your team have done a remarkable job! Matthew was extremely nervous and anxious about attending. He has always been very withdrawn and awkward in social situations, unsure of his abilities and absolutely unwilling to take risks of any kind. For him to take the risks he did with a public presentation was a huge leap and an incredible testament to the abilities of the facilitators.